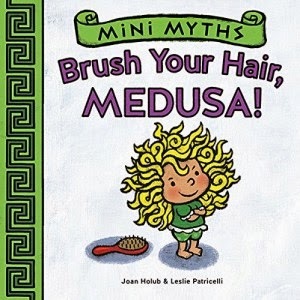 View from the Birdhouse: Book Review: Mini Myths - Brush Your Hair, Medusa! and Make a Wish, Midas! 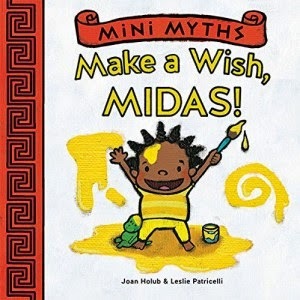 Book Review: Mini Myths - Brush Your Hair, Medusa! and Make a Wish, Midas! Medusa refuses to care for her hair, her long locks getting messier with each passing page. Her hair rebellion elicits frozen expressions of shock from her family, but nothing will convince Medusa to brush. Only her hairdresser approaches Medusa with bravery and scissors, successfully solving the problem . . . with a short haircut! All are pleased with this drastic yet adorable solution. 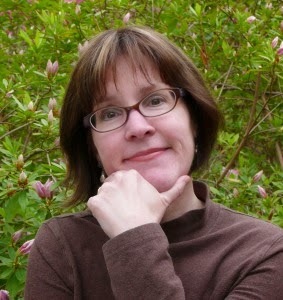 Leslie Patricelli’s depictions of this physical comedy bring a lively visual narrative to Joan Holub’s expertly focused text. Includes a summary of the original Medusa’s Wild Hair myth at the end. I love mythology, and think Brush Your Hair, Medusa! is such a clever, inventive way to introduce mythology to very young children. Medusa in this story does not have hair twined with snakes; her hair is a tangle of long curls. Medusa is a cheerful, active child and she doesn't want to sit still to brush her hair. The best solution that her father and grandmother come up with is to cut her hair short so it will be easier to brush. Then there is the issue of brushing her teeth . . . The storytelling in this book is clever and fun for a young child. I love the first two pages: "Medusa. Hairbrush." That sets up the storytelling in a way that will engage young readers. The illustrations are exceptional - bright and colorful, sure to appeal to children. The construction of this board book is wonderful - very sturdy and exceptionally well-made. I would recommend this book highly for a home library or for a preschool classroom. Midas wants everything to be his favorite color – yellow! He chooses yellow clothes, eats yellow foods, and uses only the yellow paint at his art easel. But when he impulsively paints his beloved green Dinoboo, Midas discovers that too much of a good thing is a big mess! Joan Holub’s carefully crafted text is brought to life by Leslie Patricelli’s famously humorous illustrations. Includes a summary of the original Midas’ Golden Touch myth at the end. Make a Wish, Midas! is a fun introduction to mythology for very young children. The story begins simply: "Midas" (picture of Midas and his favorite toy). "Yellow" (picture of all the yellow things that Midas loves). When Midas paints his toy Dinaboo (a green dinosaur) yellow, he realizes that not everything needs to be his favorite color . . . and some things are best just the way they are. The storytelling in this picture book is so lively and clever. Children will love to look at the pictures, and they will enjoy this as a read aloud. The illustrations are colorful and fun; young readers are sure to respond to this book. This board book is unusually well made, sturdy and beautifully crafted. This is a fun book with a great message . . . with a short version of the Midas myth on the last page of the book. I recommend Make a Wish, Midas! highly for young children. I received these books from Mother Daughter Book Reviews in exchange for an honest review. Hi Mary, thanks for visiting! I really appreciate your kind words. These little books look delightful. The Medusa one makes me think of my daughter and her unbrushed locks!